The Ashton Aged Maduro #60 is tagged with free shipping. If you order this product, your entire order will receive FREE BCP Ship Saver shipping! Ashton Aged Maduro cigars feature a seductively dark Connecticut Broadleaf wrapper that lends a sweet and earthy taste to their hearty profile. mellow to medium in body, Ashton Aged Maduro cigars are rich in bold flavor, yet ludicrously smooth on the palate. 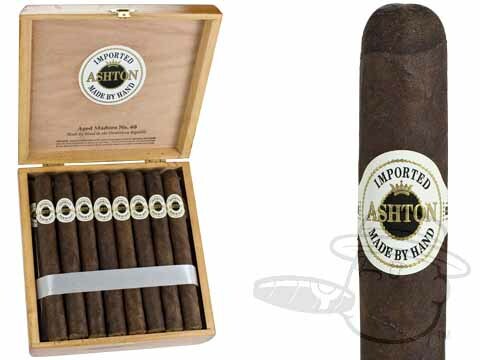 Ashton Aged Maduro #60 presents creamy maduro character in a 7 1/2 x 52 Churchill Extra vitola. Get the greatest value on Ashton Aged Maduro #60 with this special 2-Box Deal! Great cigar at a great price from Bestcigarprices. A good long smoke. One of the best out there. This one has made my number one. Great Cigar. Too pricey for everyday so it’s my weekend and holiday Cigar. Smooth, complex, creamy and spicy with a touch of sweetness and just right on the pepper. Ashton Aged Maduro #60 is rated 4.8 out of 5 based on 4 customer ratings.